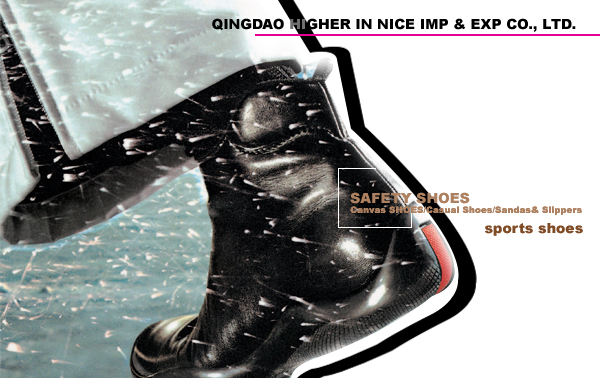 QINGDAO HIGHER IN NICE IMP & EXP CO.,LTD. Qingdao Higher In Nice Imp & Exp Co.,Ltd, mainly deals with the export business of all kinds of footwear, including cemented, goodyear welt and molded pressed work shoes, military boots and double density two color PU injection safety shoes approved by Europe CE (EN345) standard; light and comfortable sports shoes, mountaineering shoes, snow boots and rain boots with high or medium grade; all rubber all PVC series of colorful children's boots, vulcanized canvas shoes; all kinds of indoor animal or toys slippers and bathing slippers and sandals made of textiles, PU,PVC and EVA; cemented or PU injection or hand made styles of men's and women's fashion shoes, casual shoes, etc. All these products have been exported to America, Europe, Korea, Japan, Mid-East, Africa, Australia, New Zealand and Indonesia, etc. We have more than twenty years experience of dealing with the footwear business, and most of our factories have passed ISO9002, also we have a full series of QC assurance system by staffs who experienced very well in footwear designing and development, the developed export products are in more and more clients' good graces. We will be as always in conformity with the operation ideology of "Honest, Responsibility, Innovation and Reality" as well as the principle of "Quality First ,Reputation First" supplying most satisfactory products and service, develop our business together and go forward with all our friends to a glorious future.